So you want to make sewing your new hobby or spread your creative wings? What’s more, you place a high value on quality. 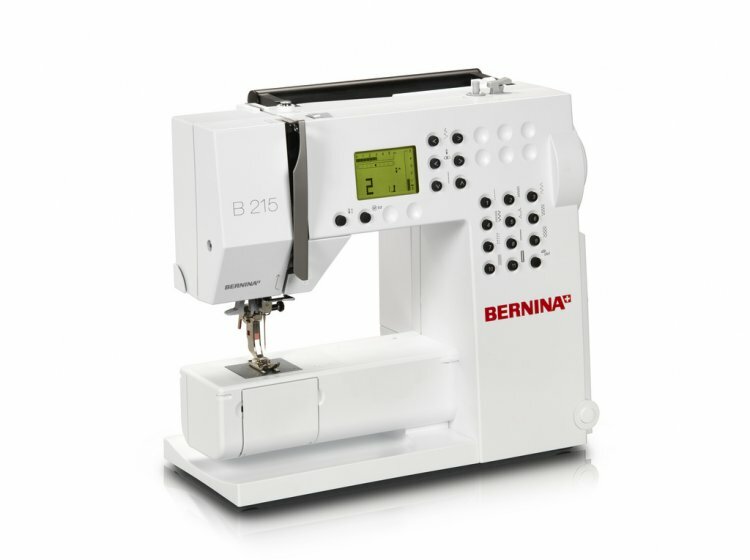 Then the BERNINA 215 is the right choice for you! It’s exceptionally user friendly, easy to handle, robust and durable. It even grows to meet your demands – if need be, it can be equipped with a host of special accessories, and adapted to your personal sewing requirements. Thread cutter: Three thread cutters make the cutting of upper and lower threads especially easy. LCD screen: The illuminated screen gives you all necessary information and settings at a glance: Selected stitch, stitch length and width, needle stop and recommended presser-foot are displayed. Needle stop and motor speed: For simple, confident sewing, you can set needle stop up/down and halve the motor speed at the touch of a button. Quick Reverse button: The reverse button enables quick and easy temporary and permanent sewing in reverse. Two spool holders: The vertical, fold-out second spool holder is especially practical when winding bobbins, and when using twin needle. Direct stitch selection: Direct selection of the most commonly used utility stitches at the press of a button – quick and practical. Stitch length and width: Simply press the buttons to change the basic settings. All settings are displayed on screen. Threader: For successful threading first time, every time. Thread tension: Adjust thread tension easily. With the default setting clearly marked, making temporary adjustments hold no more fear!